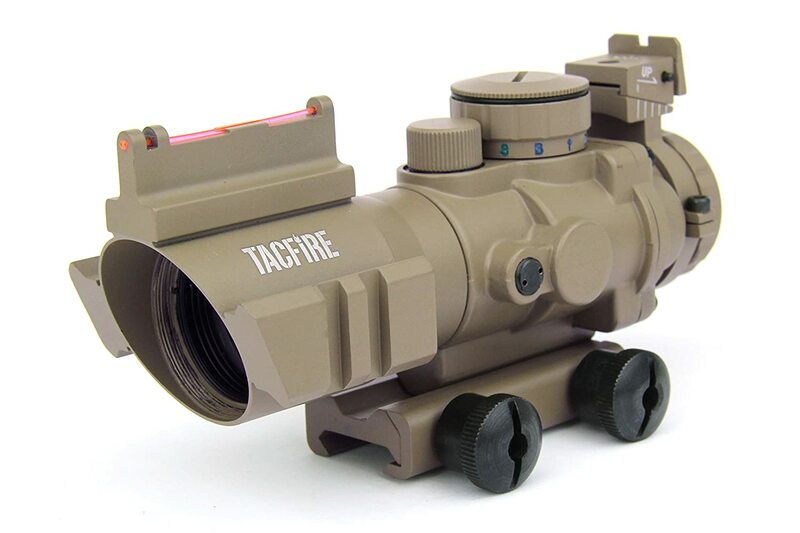 TacFire Official Product, 4x32 tactical compact fixed power rifle scope in a flat dark earth finish, with a rapid ranging reticle featuring a red fiber optic front sight with a fully adjustable back-up rear iron sight. The scope is constructed of one solid piece of T6 6061 aircraft grade aluminum. Green fused, multi-coated & scratch resistant lens for high quality light transfer & superior clarity. The reticle is laser etched & tri-illuminated with 3 levels of adjustable brightness settings per color to select from. It is fog proof with shock resistant housing, nitrogen purged and O-ring sealed. It also features an integrated picatinny/weaver mount with two 0.75" side accessory rails that can be used to add a compact flashlight or other tactical accessories. This scope is great for use in close quarter combat situations and for fast target acquisition. Scope Specs: Magnification: 4X, Objective: 32mm, Tube Diameter: 30mm, Eye Relief: 3.5", Exit Pupil: 8mm, FOV: 36.6', M.O.A: 1/4, Lens Coating: Green, Battery: CR2032, Length: 6.125", Net Weight: 16.3 oz.